In modern times, the touchscreen is as standard as an interface can be. It’s so ubiquitous that there are a plethora of videos floating around the internet depicting young children trying touch and gesture controls on books, magazines, televisions, and even windows. What’s the next step for the touchscreen? If Asukanet has any say, it’ll be dropping the screen altogether, and touching images that are floating in midair. Asukanet has shown off its Aerial Imaging Plate (AIP) at this year’s CEATEC. 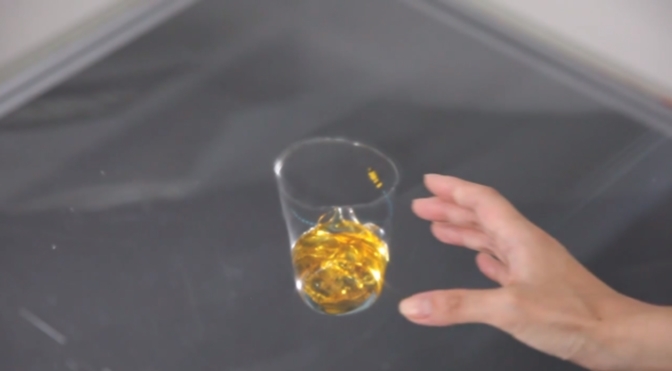 The product’s name is derived from its function — to project an image “into the air.” It essentially creates a hologram floating above a surface. The concept is similar to the holograms in Star Wars: A New Hope, except that AIP’s holograms are interactive. The device uses reflective surfaces and a touch tablet interface to project the image at a 45-degree angle. Much like a low-quality monitor with a very narrow viewing angle, the AIP’s holographic effect can only be viewed from a very specific location in relation to the projected image. To onlookers, it appears as a regular flat surface, but to a person standing in the sweet spot, the image looks as though it’s floating in the air. In what may seem like a classic case of “it’s a feature not a bug,” Asukanet feels the specific viewing angle requirement is appealing, perhaps as a privacy feature, even though onlookers can see what’s happening on the flat display. While a touchscreen hologram is certainly cool, one benefit it has that may go unnoticed is that it’s much cleaner than a standard touchscreen. If you’re poking projections in the air, you aren’t swiping your hands all over a physical screen that other people already touched. The AIP also employs the use of a motion sensor, so the holographic images can feel more alive by tracking your movements; a character’s eyes and head could follow your hand around as you wave, for example. Interestingly, though touchscreens can often make the manipulation of digital objects easier than using a mouse (or other kind of input), they also create an issue of endurance. Resting your palm on an ergonomic mouse, with your wrist on a gel bump attached to a mouse pad, doesn’t require any stamina. However, if you’re using a touchscreen laptop and shed the shackles of a mouse of trackpad, your arms will become tired surprisingly quickly, regardless of the shape you’re in. It’s the same issue that gesture control faces — use a Kinect, PS Move, or Wiimote for too long, and eventually you want to rest your arms in your lap. So, while it may look and feel like a piece of science fiction equipment, the Aerial Imaging Plate may not be the most practical piece of tech for everyday use. Keep in mind, nothing will look cooler in a theme park exhibit than a touchscreen hologram, regardless of how useful it actually is. Asukanet has been working on the AIP for a while now, and is still looking for partners to use the technology and perhaps even bring it down to a consumer level. The unit is reportedly functioning extremely well, though, so that’s the first step toward us poking through a game of Civilization V projected into the air above our keyboards.